Every once in a while I buy a single not for the A-side, but for the B-side. This is a good example. 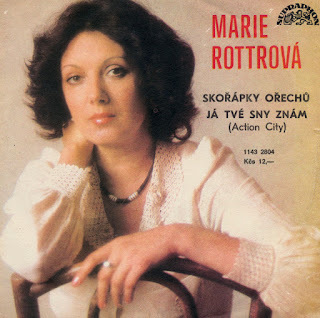 Marie Rottrová's 1983 single 'Skorápky Orechu' is a bit of a rarity for Kim Wilde fans, since the B-side features the only known cover version of Kim's song 'Action city'. Entitled 'Já tvé sny znám', you won't easily find it, but fortunately the sleeve does actually mention 'Action city' between brackets (as you can see below). Marie Rottrová was born in Ostrava-Hrušov (Czech Republic) on November 13, 1941. She was born and raised in a musical family, with her mother a singer and her father an organist. She initially started working as a bank clerk but after participating in a talent show in Ostrava she was discovered and became a member of groups like Františka Trnka, Octect, Samuel, Majestic and the Flamingos. Her first LP with the Flamingos was recorded in 1970. This self-titled debut album in the Czech language was re-recorded a year later in English as 'This is our soul'. Several solo albums followed.Rottrová still performs and records these days, although she never became as prolific as she was during the 1970's and the first half of the 1980's.